Sir Andrew Philip Witty (born 22 August 1964) has been the chief executive officer (CEO) of GlaxoSmithKline since 2008, and is Chancellor of the University of Nottingham. On 17 March 2016 it was announced that Witty will retire from GlaxoSmithKline in March 2017, and will be succeeded by Emma Walmsley. On 2 July 2012, GSK pleaded guilty to criminal charges and agreed to a $3 billion settlement of the largest health-care fraud case in the U.S. and the largest payment by a drug company. The settlement is related to the company's illegal promotion of prescription drugs, its failure to report safety data, bribing doctors, and promoting medicines for uses for which they were not licensed. The drugs involved were Paxil, Wellbutrin, Advair, Lamictal, and Zofran for off-label, non-covered uses. Those and the drugs Imitrex, Lotronex, Flovent, and Valtrex were involved in the kickback scheme. In November 2015 Witty's leadership of GSK was criticised by Neil Woodford, who said that "he’s not doing a very good job". Woodford called for GSK to be split into four companies. In March 2016 Witty announced that he was to stand down as chief executive. 1 2 Kollewe, Julia (17 March 2016). "GSK chief Andrew Witty to leave drugmaker". The Guardian. Retrieved 17 March 2016. ↑ "Executive Profile: Andrew Philip Witty". Bloomberg. Retrieved 26 March 2015. 1 2 3 Davidson, Andrew (2009-07-26). "The Andrew Davidson Interview: Andrew Witty". The Sunday Times. London. Retrieved 2010-12-11. ↑ Pagnamenta, Robin (2008-01-12). "Business big shot: Andrew Witty". The Times. London. Retrieved 2010-12-11. ↑ "Andrew Witty's journey from Graduate to GSK CEO". GlaxoSmithKline. 2008-08-12. Retrieved 2010-12-11. ↑ "Andrew Witty profile". GlaxoSmithKline. 2010-01-15. Archived from the original on 27 December 2010. Retrieved 2010-12-11. 1 2 3 "GlaxoSmithKline appoints Andrew Witty CEO designate". GlaxoSmithKline. 2007-10-08. Archived from the original on 27 December 2010. Retrieved 2010-12-11. ↑ "Andrew Witty Profile at Forbes.com". Forbes. 2009. Retrieved 2010-12-11. ↑ "Andrew Witty: Executive Profile & Biography at BusinessWeek". BusinessWeek. Retrieved 2010-12-11. ↑ Boseley, Sarah (2009-02-13). "Drug giant GlaxoSmithKline pledges cheap medicine for world's poor". The Guardian. London. Retrieved 2010-12-11. ↑ "GlaxoSmithKline". BBC News. 4 July 2012. ↑ "GlaxoSmithKline Agrees to Pay $3 Billion in U.S. Drug Settlement". Bloomberg. 2 July 2012. ↑ Fred Mogul (2 July 2012). "NY to Get Millions in GlaxoSmithKlein Settlement". WNYC. Retrieved 2 July 2012. ↑ "BBC News -GlaxoSmithKline to pay $3bn in US drug fraud scandal". BBC Online. 2012-07-02. Retrieved 2 July 2012. ↑ Thomas, Katie; Schmidt, Michael S. (July 2, 2012). "Glaxo Agrees to Pay $3 Billion in Fraud Settlement". The New York Times. Retrieved July 3, 2012. ↑ Ahmed, Kamal (2013-07-19). "GSK chief Andrew Witty set to admit China 'scam'". The Daily Telegraph. London. Retrieved 2015-01-09. ↑ Rojas, John-Paul (2013-07-24). 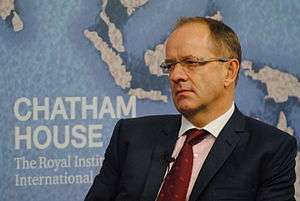 "GlaxoSmithKline boss Sir Andrew Witty:: UK headquarters 'knew nothing' of China fraud". The Independent. London. Retrieved 2015-01-09. ↑ The London Gazette: (Supplement) no. 60009. p. 2. 31 December 2011. ↑ "Flora London Marathon - Andrew Witty's Fundraising Page". JustGiving. Retrieved 2010-12-11. ↑ Peston, Robert (2008-08-30). "Leading Questions: Andrew Witty" (Flash video, 21m30s). BBC News. Retrieved 2010-12-11. ↑ Lyall, Ian (2008-10-23). "City interview: Glaxo's Andrew Witty". This is Money. Retrieved 2010-12-11.